David Armand isn’t exactly a house hold name, but show people a clip of his seriously funny mimes to contemporary songs and they instantly recognise him, and more often than not, instantly love him. Along with appearing in some of our favourite TV shows, April will see him perform at the Leicester Square Theatre as one of the headline acts for international cabaret show Cirque du Cabaret. London Calling’s Sara Colohan asked him a few questions about his interesting career path! LC: I have a feeling you’d prefer this to be a silent interview – ok if we ask you a few questions? DA: That's fine, but my voice will have to be spoken by an actor. I'll see if Alan Rickman is available. LC: Most people know you from the telly Fast and Loose, How Not To Live Your Life and Peep Show – but you are also a cabaret performer and a rather ‘serious’ actor. Would we have seen you in anything recently? DA: Despite my best efforts, I wouldn't say I was particularly serious, sadly. The most serious thing I've done recently was a play (Absent Friends) in the West End last year. I've been doing a lot of cabaret shows recently and have just starred in a pilot for BBC Three which should be out soon. I'm also a writer, and have been penning bits and bobs for a variety of TV shows. LC: How did you form your style of mime act, was it an accident air guitaring at home late one night or much more measured? DA: It couldn't be less measured. It's how I dance when I'm drunk. Always has been. I used to be part of a sketch group (The Hollow Men), and the other three members convinced me to put it in our Edinburgh show one year. I had my doubts that it would work - who wants to see a man flailing about to 90s hits? But it quickly became a huge part of the show. And then it started taking on a life of its own. I think it appeals because there are a lot of other people whose inebriated style of dancing is very similar. 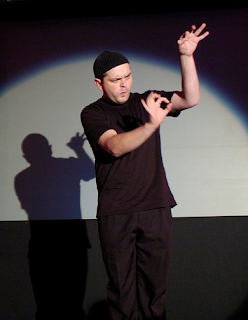 LC: Is there a genre name within mime for what you do – like ‘literal choreography’ or are you unique in the mime world? DA: I never really described it as mime, I always called it "interpretative dance" instead - which was meant as a joke but sadly wasn't particularly funny. 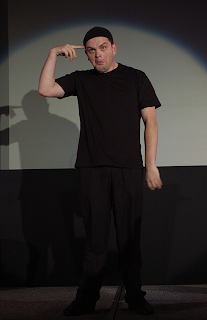 Lots of people have done something similar - Lee Evans for example - but I think I'm unique in taking it so ridiculously seriously. LC: You performed Torn with Natalie Inbruglia singing live - how did performing at The Secret Policeman’s ball come about? Probably not Natalie’s idea – did she need some convincing? DA: I got a phone call asking me to perform at the ball, on one condition - that she sing it live alongside me. I thought they were kidding. I had always been terrified that she hated the whole thing and that when I met her she would sue me or punch me in the face or something, but it turned out that she was a big fan. She was incredibly lovely and I turned into a dribbling, squeaking 11 year old around her. It was her idea to join in the mime on the last chorus, and I ended up having to go to her hotel room the night before to teach her how to mime to her own song. It was the most surreal experience of my life. Even now I'm not sure if it only took place in my imagination. LC: What events have you coming up in London? DA: A load of stuff! Its all updated on my Facebook page. I’ll be headlining Cirque du Cabaret’s show over at the Leicester Square Theatre on April 20th – performing with some sword swallowers and burlesque ladies. That should be fun! David Armand appears along with Banbury Cross, sword swallower Jewels and with live music from Elle and the Pocket Belles on April 20th - Leicester Square Theatre. For more information and to book tickets please click here. His new Friday night DJ residency at The Book Club is a melting pot of musical diversity. A night listening to Spoken Word (a form of literary art, where lyrics, poems and stories are spoken rather than sung or written) can strike the fear of God into many of us, conjuring images of being trapped in a basement surrounded by chin stroking beatniks in nylon polo-neck jumpers. Cult poet John Cooper Clark came to the rescue of the genre in the 70’s and indeed still flies the cool flag for Spoken Word today. Seen as pioneering he was hailed as a genius Punk Poetas he braved the rough unchartered punk scene, reciting breakneck speed original poetry to what was often a hostile audience. He eventually won them over, creating an unprecedented cult status for Spoken Word poetry in the UK and worldwide. 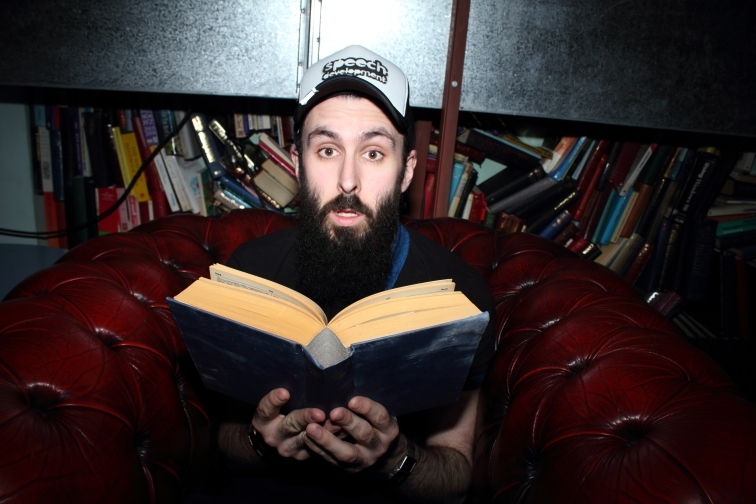 Since John Cooper Clark paved the way, spoken word ‘stars’ have been thin on the ground but in 2006, the rare talent of Essex boy Scroobius Pip emerged. With the help of fellow Essex boy DJ Dan Le Sac he encouraged a whole new generation to acquaint themselves with a post-millennial spoken word scene. Best described as a Beat Poet, he wrote the widely acclaimed Thou Shalt Always Kill which went viral (chalking up 3.5 million views on Youtube) eventually earning him a record deal with Rob da Bank’s label Sunday Best Recordings. 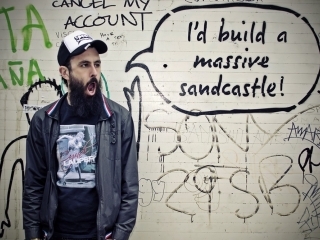 His spoof for X Factor with Dan Le Sac, created to promote their Letter to God single in 2009 also went viral and cemented their cult cool status. 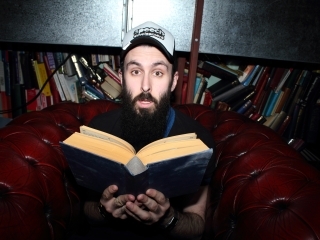 Scroobius Pip’s solo album Distraction Pieces, was released late 2011 and since then, he’s been hard at work touring a solo spoken word show called ‘Words’ which he developed after his success as headline act in Latitude’s poetry tent 2012. That tour has led him to agreeing dates at this year’s Edinburgh Fringe 2013 and you can see him perform there in August. 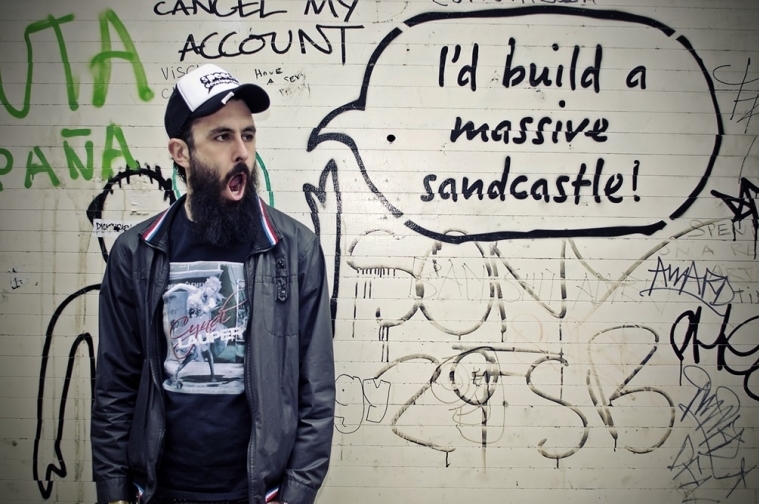 He will also be appearing at Hill Farm’s Truck Festival in July with dan Le sac. Back in London, he’s enjoying his eclectic DJ monthly event in The Book Club, East London. Each month the diverse DJ line up changes and the music is as random and eclectic as you could hope for. Donning his lizard mask, the man himself plays a set each month and carefully chooses great warm up and closing Dj’s including Don Letts in April and Annie Nightingale in May to make the night a real gem in London. Remarkably, this night is free (free before 9pm open till 2.30am) So it’s official – there’s still a bargain to be had in Shoreditch!